It’s Rate the Dress time! 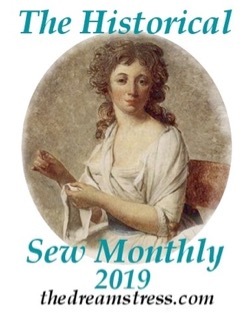 Every week I post a historical garment, or a portrait, and we rate the garment in the context of it’s time. 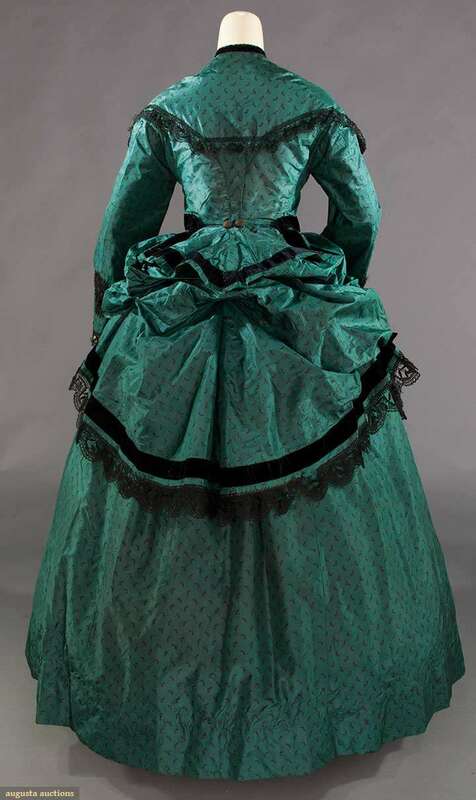 This week’s pick is a 1868-70 dress that features the full skirts of the elliptical crinoline era, topped by the bustled skirts of the first bustle era. Last week’s gold evening gown proved that Doucet the Midas Touch when it comes to fashion, because you loved it. No one was the least bit worried by the implied lingerie-ness of the dress. It did lose a half point here or there for the extra back bows (you just can’t get behind those, can you? 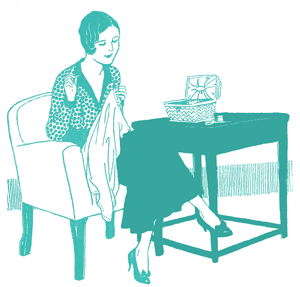 ), and some of you thought there was a disconnect between the skirt and upper bodice. Points were both gained and lost for fungus-y embroidery. Mould that breaks the mould? A few of you saw a face in the bodice, and took points off for that. Apparently we like garments that have personality, not a personality! The Total: 9.6 out of 10. Despite a few niggles, the dress had the highest total points in over two years! All added up and divided, it came out .1 point shy of the 9.7 highs of Doucet’s Cubist dress. So close, but that record still stands! 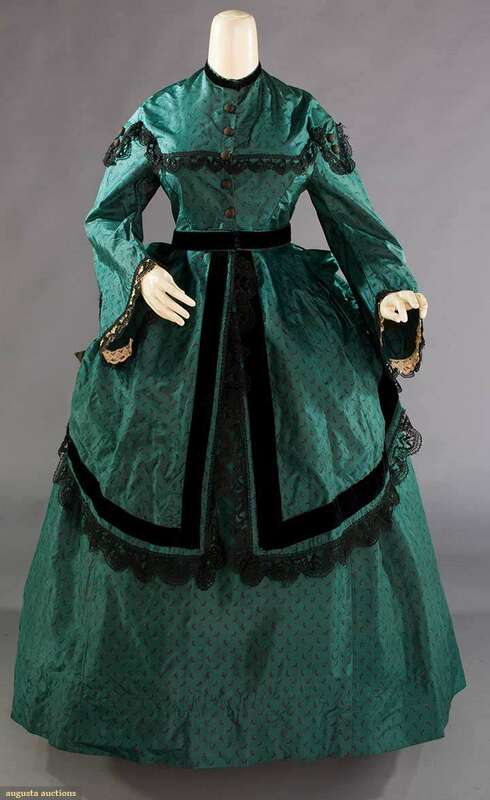 This very-late-1860s day dress in rich green silk with a small floral print is an excellent example of aniline dye influenced fashion. The pairing of vivid colour with black trim was oh-so-fashionable at the time, showing off the aniline brights, and the equally desirable aniline black. The black trim is used to highlight the dresses details. The bodice trim widens the bust and shoulders, to assist in the illusion of small waist. The skirt trim emphases the newly fashionable overskirt with bustling effect, which which quickly become the full, wide bustle of the first bustle era. 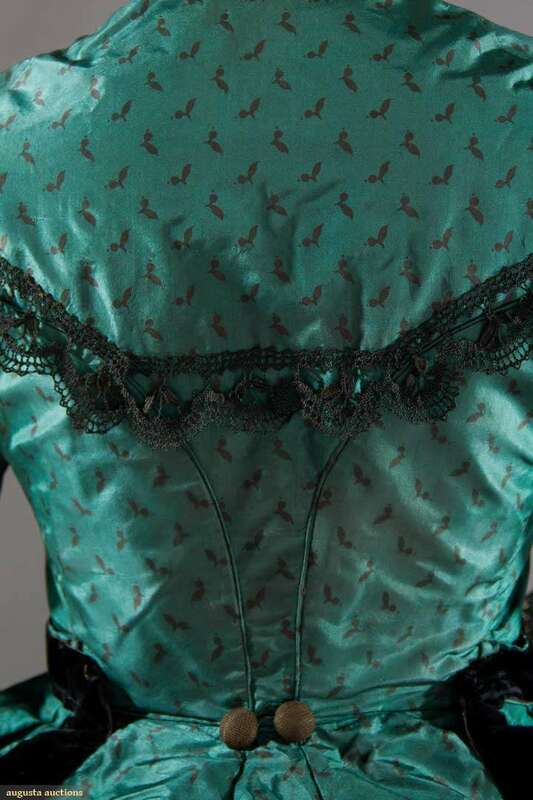 The piping that frames the bodice panels was used throughout the 19th century. Some high-end examples even have double-piping, particularly at the waist. What do you think? Does this dress balance the end of the crinoline era and the beginning of the first bustle era successfully? Is it attractive as an example of its period? Interestingly and beautifully enough arranged to stand out in a sea of wide skirts in vivid aniline tones? I love the colors, and that makes me fall head over heels for this dress! 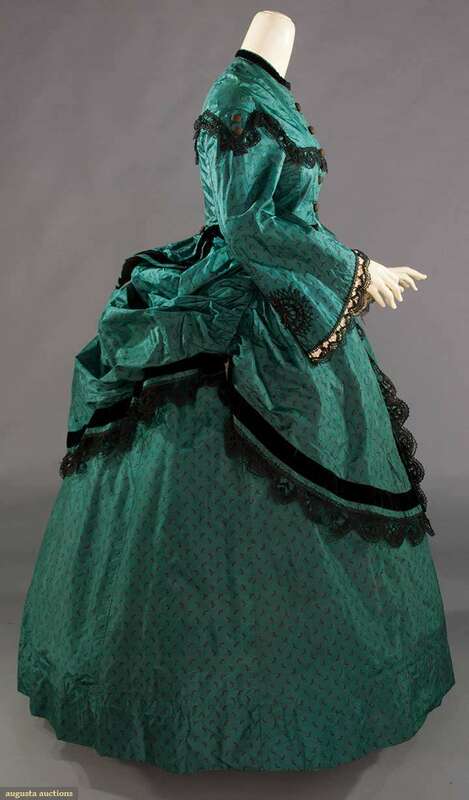 I’ve never considered making a bustle-era dress, but if I did, I’d want do do something like this. I like the combination of Cluny lace and velvet ribbon; it makes the trim look balanced – just the right amount of frilly bits. I love it, too! I am not a pro and don’t know enough about bustles, but it seems like a really exquisite representation of what I imagine the style would be. It has so many extras that someone re-creating a dress might think is over-the-top, but it’s well-made, well-preserved (I know it’s not a preservation contest, but it’s hard for me to imagine some pieces in their original form,) and thoughtfully detailed. If there were more colors, it would fail, but the simple 2-color palette help the details stand out in their full glory without being too overwhelming. Although green is my favorite color, there are many, many greens I think are ugly, and this rather blueish green is one of them. Possibly my prejudice against the color is why the lace trim reminds me of cobwebs, and the black print motif (which I believe is meant to be fruit) makes me think of bats. Otherwise, the trim and silhouette of this gown are rather conventional for the period. The rear view is elegant, possibly the best aspect of the dress, but it isn’t enough to change my rating. I might be misreading the dress, but it strikes me as cozy and somewhat matronly. I think it’s the big shape of the skirt and that particular green, which strikes me as Christmassy. Plus the front embellishments do look like an apron. I like the dress – particularly the wide black bands – but it doesn’t feel very standout to me. Being the height of fashion notwithstanding, it feels like it’s just sort of a nice, eye-pleasing Victorian dress without a whole lot to say. Though the print is really cute now that I take another look. Love the color, the lace is nicely used. I’ve never been fond of this transitional period, but the shape of this one is pleasing. I especially like the back. I’ll give it a 9.5. The colors are pretty, my first glimpse of the torchon made me happy, the dress is interesting, and the print looks rather cheerful close-up. 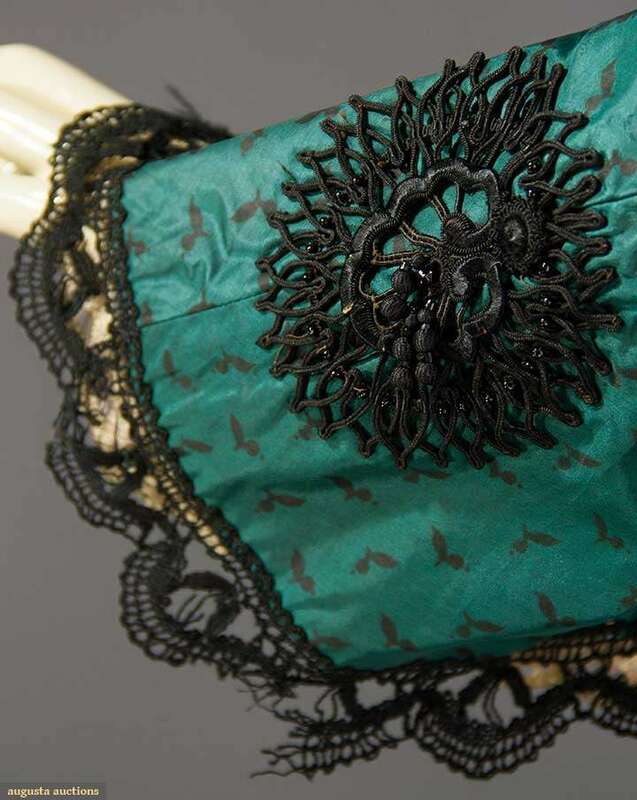 Before I could have a good think about rating and reasons, the close-up photo of the sleeve with all the damaged lace made me want to repair it. 🙁 Probably not best practice for something of this age, so conservation, instead. Wonder if it’s silk as well, and shattering. 8 – Possibly influenced by damaged-lace sadness. Lovely dress, and the green and black is effective. Why are there buttons on her shoulders? This makes no sense to me. This is gorgeous!! The black perfectly sets off the vivid green and there is just enough trim to make it look elegant without being fussy. The bustle is a bit much but not as big or ugly as in later years. 9.5!!! I don’t know, I am partial to the pop of color on the sleeves. the workwomanship is very good and the colors are good together. I give it an 8/10. BTW I emailed you though your connect me link. Bloggers don’t often meet but I am at the Weir House for the next 6 weeks as part of a study abroad program from Atlanta GA. I am one of the adults in the room not a student. 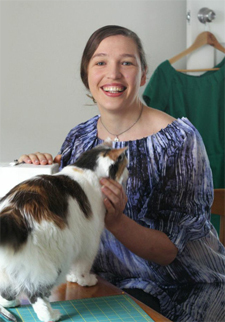 I would love to meet you and your New Zealand invasive species ( Felicity the cat) if you have the time. Sorry I am surrounded by biology professors who are pointing out all of the invasive species on the island. Lovely to hear from you! <3 Unfortunately my contact form ate your message (which it sometimes does, and I haven't been able to figure out why). I'd be delighted to meet you, and have sent an email. The green and black was so close to being too severe but I think the dress just about pulls it off. The large black lacy motif on the sleeves was also on the verge of looking like a particularly flourishing fungus (is it just me?!) but I do love the lace used overall and although this is probably my least favourite era I would say this dress does it pretty well. The dark green colour is definitely not one of my favourite colours but I could imagine it being really flattering on some people and there’s nothing I really hate about this dress. I also find the two lonely buttons at the back rather endearing for some reason and they bring out the small print on the dress. I can’t decide if it’s a feature of the dress, or just an awkward mannequin pairing, but the silhouette seems a bit off. I really like the colour, and the detail is really lovely, but overall it just seems a bit big and blousy everywhere. the wide sleeves and wide yoke and masses of bustle are just a bit overwhelming – and there’s something weird going on at the shoulders. Overall lovely colours, but too much fabric and width! I find the neckline boring and I think the almost epaulets on the shoulders with the buttons too much. I do like the shape of the skirt and overskirt. I also think the mannequin is wrong,not enough bosom. You know those wierd dolls things they used to sell at craft sales, that doubled as bathroom decor/covers for your toilet paper rolls? Circa 1993? That’s what the lace makes me see. When my imagination removes the lace, I see an awesome interplay of solid geometric lines and shapes against soft, billowy folds. And n excellent colour combination. Ahhhhhh, that’s much better. The green is great, the solid black trim is great, the print is great, the overall shape (even though I don’t love this era) is great, and the workmanship is fabulous. And the lace is hideous. Making the whole thing a 6.5/10. Very pretty, especially for a transitional style! As an example of its era, it’s good. I like the way the brown sprigs tone down the gaudy green. (BTW, the aniline dyes of the 1800s were a boon to the developing science of bacteriology. I had lab coats with splotches of that color, brilliant green or bromcresol green). I am puzzled by the brown buttons and the black lace combination. The buttons match the sprigs so well that I think it was deliberate. There’s a nice balance between crinoline and bustling – neither one is dominating the dress, unlike the later ones that looked like a caboose following the dress. My quibbles are probably just personal taste. The velvet ribbon is too heavy for the delicate lace and sprigging. Perhaps this was fashionable. But I have seen a similar dress that used several bands of narrow ribbon that was more in scale. Tsu Dho Nimh: I suspect that the brown buttons were originally black and had faded. Just because some of the ornamentation on the dress was dyed with the latest aniline dyes doesn’t mean that all of it necessarily was. Wonderful. And those are seagulls, not bats, flying around on the dress’s fabric. They add a breezy air to the otherwise sober lines. That said, I don’t particularly care for the shoulder-widening effect of the black braid on the bodice – perhaps because I’m already broad-shouldered and don’t need any enhancement in that area. Otherwise – it’s a beautiful dress, fashionable without being extreme, and I can just see it being worn by the lady of the house at a winter’s afternoon tea with her best friends as guests. 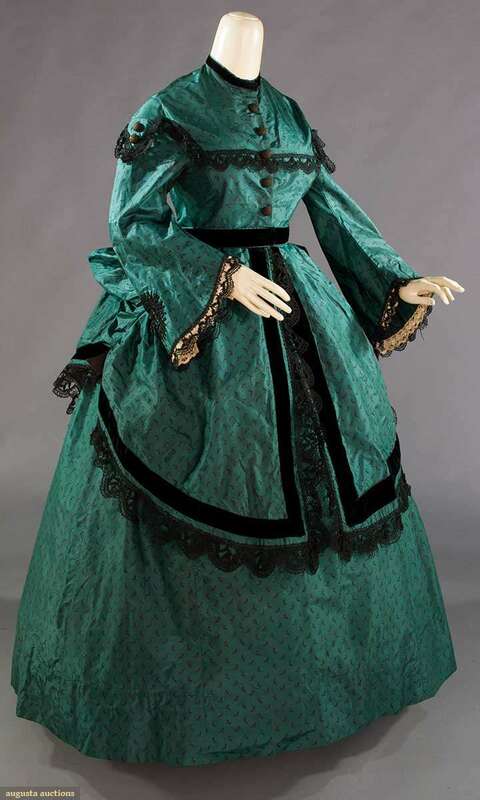 I do like it for what it is and I do think some bits are lovely–the figured silk, the shade of green… but I don’t think it stands out too much from other aniline dyed dresses–perhaps it is too reserved in color, lol. I give it 8/10. I like this dress a lot, but I’m not crazy for it. I think it’s a great example. Just something about it that doesn’t elevate it for me enough. Perhaps there is just too much of the colour and not quite enough detail to make it feel truly designed or thought through. Actually, that’s it – this dress feels like it was made as a dress first, and that there wasn’t really too much consideration or flair given to its design – no really creative thinking, not quite enough adventure, apparently no whimsy or adventurousness. This is a very unrevolutionary dress – very nice, but I’m not really getting much sense of a personality either from the maker or the wearer. Everything is very proper and correct, but there isn’t much taste to speak of – enough good taste to pass muster, but no bold or questionable taste to make it amusing or intriguing. The front is very meh to my eyes, because the buttons don’t warm me up to it (and 1870s in general…), and neither does the apron effect. The side view is pretty gorgeous. The back slightly less so but still pretty. 6,5/10 seems like a good average of that three-way mix of impressions. I like the colour, I just find the whole thing kind of uninspiring. I don’t love it, I don’t hate it. It’s just not very interesting to me somehow. I think the wearer would fade into the background in this dress. Beautiful dress! I think it is black and blue though, some may disagree. The embroidery was some of the better I’ve seen— especially in dresses from this decade. I’m a former Elizabethan costumer just dipping my toes into this era. As a native (US) Southerner I’m regionally steeped in the mid-1860’s Civil War silhouette, but so far I ‘m really falling in love with this more back-swept transitional period. Those big bell-shaped hoops are a serious trial to wear! I love the colors on this dress. That particular shade of teal had always been one of my favorites, especially combined with the stark black details. The velvet ribbon and black braid is yummy. I’m not so fond of the big buttons (I agree they’re probably faded from black, not originally brown), and the fine lace at the cuffs and on the overskirt doesn’t seem to me to match the broader scale of the rest of the trim. Although it’s odd that the lace on the bust and shoulders does work when the other doesn’t. To my eye a short fringe or a ball-fringe trim would better suit the rest of the dress. I do have several construction questions I’m hoping you can answer. Is the black band at the neckline part of the bodice or the conservation? The white lace on the sleeve cuffs is part of the conservation to preserve the deteriorating lace, yes? In the close-ups of the bodice, of the back buttons in particular, it looks as though the overskirt is attached to the bodice as one piece. The break in the front of the black waistband is where the bodice closes (probably with a hook and eye). Is that right? 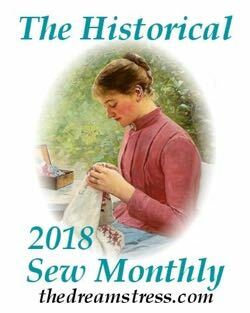 My understanding is that, in period, the day dress would be worn with a white collar and white, cuffed undersleeves, but those aren’t shown here. Is that another conservation choice? Thank you for the chance to see this beautiful dress. My rating would be 8.5/10. That would be -2 pts for the mismatched lace, and +0.5 for the gorgeous color.